The glaze on this ham takes it to a whole new level. 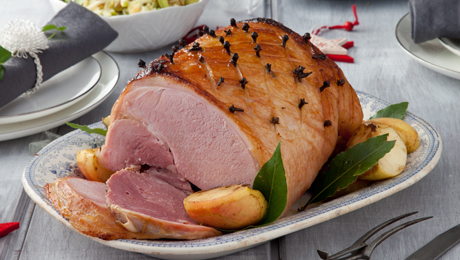 Soak the ham in a large bowl of water for up to an hour to remove any excess salt. Place the ham in a large pot, cover with water and bring to the boil. Allow to simmer for about 2 ½ hours, then turn off the heat, allowing the meat to cool in the cooking liquor. Remove the ham from the cooking liquor and remove the outer rind. Score diamond-shaped lines into the fat. Stud cloves into the layer of fat and put onto a baking tray. While the ham is cooking, prepare the glaze. Combine all the glaze ingredients in a small saucepan over a medium heat, whisking to combine. Bring to a simmer and cook for 2 to 3 minutes, until slightly thickened. Remove from the heat and allow to cool. Brush the glaze over the studded ham. Loosely cover with tin foil and bake in the oven at 150°C/300°F/ gas mark 2 for 45 minutes to 1 hour, depending on your oven. Take the foil off at this stage. Brush any leftover glaze over the ham and turn up the heat for an additional 5 to 10 minutes. Rest the meat for 30 minutes once removed from the oven before slicing.